I just read a nice article by my brother Pedro Fleitas and I would like to dig deeper in its direction. When we began training in the Bujinkan martial arts we couldn’t fathom how much it would bring to us as a human being; how much it would transform us. We were more interested in learning a “martial art”. Through the last 26 years we learnt the martial art but we also learnt to become true human beings. Too many practitioners today are training for the wrong reason as muscle power is limited in time so it shouldn’t be our main objective while training. What is definitely more important is to develop our own potential, our own abilities. All through these years people have been focusing too much on the omote where in fact only the ura matters. Knowing thetechniques can be interesting for a while but knowing yourself is more vital to live a happy life. How many teachers in the bujinkan are only teaching “forms” and do not get the essence of the bujinkan? A lot! I remember once speaking with sôke who told me that the important thing he has been teaching in the last years were not the schools but the concepts they conveyed. These concepts of san jigen no sekai, yûgen no sekai, kasumi no hô, shizen, etc have taught us more on how to live our lives than fighting techniques. Even though this apprenticeship has been the key to learn to defend ourselves efficiently. By understanding the ura side of things, the omote becomes obvious. In 2010 we have entered a new era in the bujinkan with the arrival of many high ranks. Things are changing as always and now is the time to ask yourself the good questions. Long time ago I have decided to put aside the “ninja” stuff and to follow the teachings of a man, Hatsumi Sensei; I decided to become a disciple and not only a good technical martial artist. Is it what you are doing? And if it is not, do you think it is worth spending your free time collecting forms instead of developing the fantastic human being hidden within you? 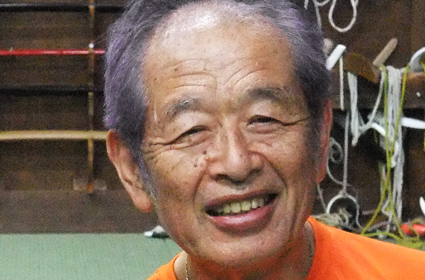 Hatsumi sensei might be the last true budô master of Japan and his teachings go far beyond simple body mechanics. Maybe it is time to think about it. This is the essence of the Art!! It is so important that we get what the “forms” have to teach us but not just stay with those “forms”! The principles found within those “forms” teach us valuable lessons in how to live, not just in how to defend yourself from a physical attack. I value so very much what I’ve learned from our Soke and want to see those benefits passed on to many others. Very good observation and I completely agree. The lessons we learn in this art directly relate back to who we are and how we live our lives. I hope that other teachers eventually see the life benefits that one inherits from this art and from our Soke.